The other options is a Gigabyte Saber 15-W8, it has the Windows key in the right places for starters and I think access to the rear is quite easy. It doesn't seem to be for sale in many places. Getting back to MSI, do all of their laptops have the Windows key on the right? Is it something you get use to? The Sabre 15-W8 looks good. Have you any reviews of even for sale anywhere? I'm also form the UK, so that's where i'd get it from. The gt75 has the windows key on the left as usual and so does the gs65 I believe. For the rest it seems to be on the right. In the year I owned the gt72vr that was the least of my problems and I got used to it rather quickly. It just requires using 2 hands for some shortcuts instead of one. As for other brands, I have no experience with them so can't help. The thing is, there is usually a big mess regarding the screens. MSI should have addressed this but they haven't so far. There was a major confusion as well with the gt72vr as some models came with 75Hz IPS 1080p screens in SOME countries, but the resellers usually failed to specify this and the poor person bought it, thinking he would get the normal 120Hz TN panel. While some might be happy with the IPS one, many reported issues such as color banding, light bleeding etc. The TN panel is amazing in my experience though, both on the gt72vr and the gt75 now. 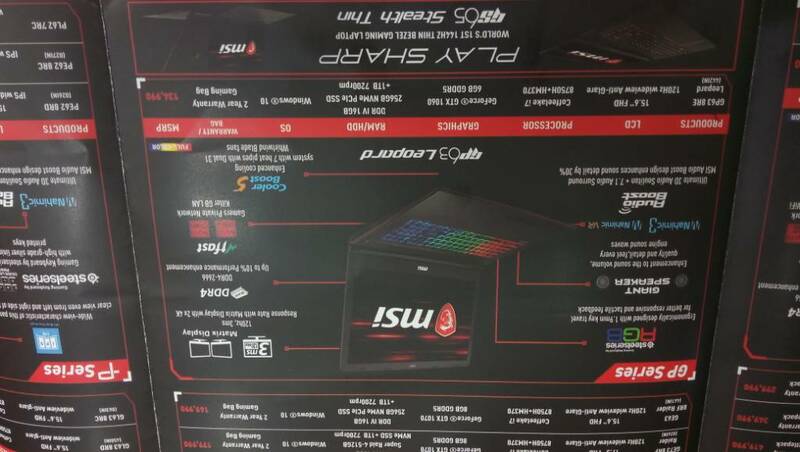 So yeah, MSI is not clear at all about which models come with what and some resellers don't bother checking. I started a new thread in the Gigabyte forum about this model. This is from the USA website assume they have something similar for another country if you are not in the USA. Lists what screen is with what part# Example GP63013 or GP63 Leopard-013 has 120hz display 94% NTSC and a GP63041 or GP63 Leopard-041 has a 45% NTSC display. The two GP63 US model's I see with the 120hz 94% NTSC display are GP63 Leopard-013 has GTX1060 and GP63 Leopard-428 has GTX1070. My google search came up with no place listing the -428 yet. I don't recall seeing the -428 sku so think they just recently added it. The model available in Thailand is the MSI GP63 8RE-080TH. It's listed as 45% NTSC. I believe the IPS screens are the 60Hz ones... I'd always preferably get the 120Hz one unless you hook it up to an external screen at home. I do that anyway as 27 inch curved 144Hz screen is impossible to beat by a laptop no matter how awesome it is. I just visited the MSI importer/distributor in Delhi. ₹133,000 ($1966) for the 120 hz / 256 NVMe / 1TB version. It seemed quite expensive. Tomorrow I will be in Thailand and check there. Yes, seems expensive. Do check in Thailand, that would be great, though ordering one to the UK might also be expensive.